I’m a lover of shiny, metallic things. Tell me something I didn’t know, I can hear you say. 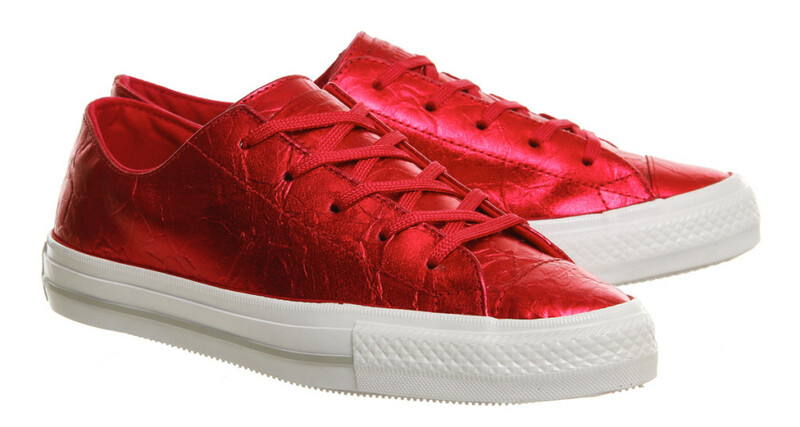 Well did you know about the brand-spanking new metallic – or as they’re calling it “foiled” – Converse. Because they’re everything and more. And my feet need them. Pronto. If shoe retailer OFFICE and Converse teamed up and had a shoe baby, this is what it’d look like. Oh wait, that already happened. And it’s dreamy. Reader, meet the Chuck Taylor All Star Gemma, she’s a delight. And soon to be very good friend of mine. I could give you all the boring details about the almond toe shape, the cushioned sole and signature branding, or I could harp on about their delicious colours from pretty standard golds and silvers to sapphire high-tops and my personal faves, the low leather ruby ones. Which, in case you hadn’t already understood from this post, I want. Badly. I’d give my left arm for a pair. But not my right, because then I couldn’t Tweet competently. And that’s important to me. Check out the entire collaboration and hit my up in the comments below with your fave.